This month Paper Fort is featuring poems from books by the 2008 finalists for the Stafford/Hall Award in poetry. 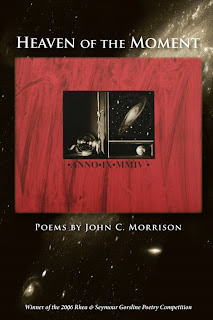 Promise of More is from Heaven of the Moment by John Morrison. And it’s stuck with me that we live in a rain forest. And that means rivers and fish, and my folks spent several years smelting. One summer my brother and I were visiting my folks when they lived on a small house along the Tualatin River and they used our appetites to empty their freezer of their last smelt. I may have forgotten the pain, but it seems after a few drafts of an opening stanza I hit upon the music, rhythm and tone that brought the rest of the poem pretty quickly, what became a homage to my parents’ Oregon generation. What was most difficult is still the crux of the poem,the “and I say without regret,” but I had to trust the voice at that moment whether it works or not, or is even true. school. A hundred is a good day. a rain falling softly on all our rivers.